Lewis Hamilton has converted his 68th pole position into a clinical Belgian victory in his 200th Formula One grand prix. Hamilton was impressive all weekend, blitzing qualifying and executing a perfectly judged defensive grand prix to keep Sebastian Vettel at bay despite the Ferrari following menacingly throughout the race. The Mercedes was only truly threatened at the safety car restart on lap 34, when Hamilton’s soft-shod car was momentarily outgunned by Vettel’s ultrasoft-shod Ferrari, but a deft piece of throttle work by the Briton — he slowed momentarily in Eau Rouge to force Vettel to likewise slow — ensured Sebastian wasn’t able to maximise the tow down the Kemmel Straight, after which he was unable to launch an attack. 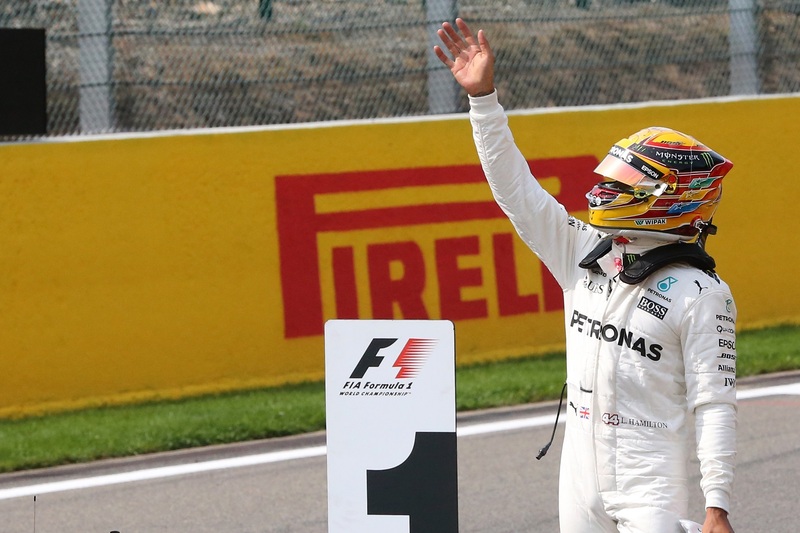 Hamilton was home, slicing his drivers championship deficit to seven points in the process. “It’s been a strong weekend for myself and the team,” Hamilton said. “The team did an amazing job, and I’m really grateful for all the hard work. Vettel found the podium experience bittersweet after coming so close to claiming victory at what had long been tipped as a Mercedes-prefered circuit, but the fact that Ferrari had found pace on the type of circuit on which it had thus far struggled to perform this season was a cause for optimism. “It was good fun,” Vettel said. “It was really intense because every lap I was waiting for Lewis to do a mistake, but he didn’t. “I think we had fairly good pace if you compare this track to Silverstone. We’ve done good steps forward. Daniel Ricciardo made an unlikely sixth podium appearance of the season after teammate Max Verstappen suffered his sixth retirement of the year. Verstappen was running in fifth when his Renault engine expired on lap eight, moving Ricciardo up one place. The Australian then gained a second place when Kimi Raikkonen served a 10-second stop-go penalty from fourth for flagrantly ignoring double waved yellow flags protecting Verstappen’s stopped car, and he made up his final position by mugging Valtteri Bottas at the safety car restart for third. “Max dropped out early — I know it’s pretty much full of Dutchies here, so thanks for hanging around!” Ricciardo said, referencing the legions of Dutch fans who made the trip south of the Belgian border for the race. Kimi Raikkonen finished fourth ahead of Valtteri Bottas, who dropped from third to fifth when he was pinched by Ricciardo and Raikkonen at the safety car restart. Nico Hulkenberg raced a quiet grand prix to sixth at the head of the midfield, while Romain Grosjean and Felipe Massa in seventh and eighth capitalised on Force India’s drivers crashing into each other to vault deep into the points. Sergio Perez and Esteban Ocon twice crashed into each other in almost exactly the same part of the track. On lap one Perez accidentally squeezed Ocon against the wall on the run down to Eau Rouge, the Mexican himself defending against another car on the outside and dropping to P11 afterwards. He later recovered, but after the second round of stops the pair met on the same part of track again. Perez scythed down the inside of his teammate at turn one and then squeezed Ocon against the wall a second time, on this occasion apparently deliberately. Perez punctured his rear-right tyre, which ultimately forced him into retirement, while Ocon had to replace his front wing on his way to salvaging ninth. Carlos Sainz scrapped home for the final point in tenth for Toro Rosso. Fernando Alonso provided something of a sideshow, the Spaniard starting the race in P10 and leaping to seventh on the first lap but predictably sinking like a stone back through the order afterwards thanks to his woefully underpowered Honda power unit. Alonso’s team radio broadcasts provided a window into the double world champion’s frustrated state of mind until he retired with an undisclosed engine problem on lap 27.